Prüm's 2015 Bernkasteler Badstube Kabinett opens with a spring-fresh bouquet of slate and white/yellow-fleshed fruits. 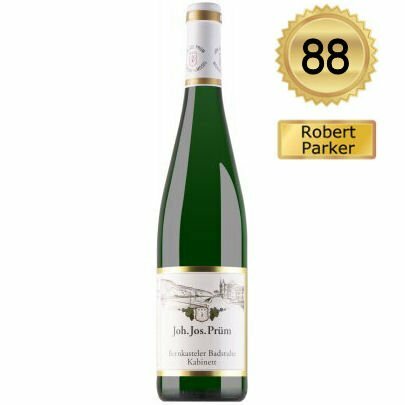 Light-bodied but lush and fresh, this is a classic Prüm Kabinett with nice grip and 9% alcohol. Katharina Prüm is very happy with the 2015s, but she is also wondering why this vintage is that enormously hyped, when other exceptional vintages such as 2013 are still underrated. After a pretty rainy June, 2015 saw the hottest July that Katharina and even her father Manfred Prüm can remember. Then, surprisingly, September was not just rainy but cool—even cooler than the long-term average. This did not just cause pronounced acidities, but it also protected the grapes from severe rot. "Luckily, October was was not only slightly cooler, but also much drier than average, providing excellent harvest conditions," says Katharina Prüm. The harvest started slowly in early October and was finished on November 4th. Team Prüm was able to select all predicate levels from Kabinett to Trockenbeerenauslese, excluding Eiswein. The resulting wines are very clear, fresh, cool and aromatic on the nose and reveal a remarkable precision. The palate is characterized by its ripe, lush and intense fruit, as well as a racy-piquant acidity. Several of the finest wines were auctioned in Trier (2015 Wehlener Sonnenuhr Spätlese and Auslese; 2015 Graacher Himmelreich Auslese Gold Capsule; 2015 Wehlener Sonnenuhr Auslese Long Gold Capsule; and the 2005 Graacher Himmelreich Trockenbeerenauslese), but the 2015 BAs and TBAs will only be auctioned later. The highlights of the 2015 portfolio beyond the Graacher Himmelreich Trockenbeerenauslese contain several Auslesen and Spätlesen, so there are great new wines for all lovers of the Prüm classics. Since 2016, Katharina Prüm owns the neighboring Weingut Dr F. Weins-Prüm, whose 2015 vintage was the last one. Whether the name will stay as a brand is not yet clear. Possibly, Katharina will start a new project with a new name besides the family estate. Reasons enough to stay tuned.